The gout foods table for vegetables covers key foods in the Vegetables and Vegetable Products group from the USDA food database. My gout foods tables are based on a serving size that provides 100 calories (Kcals) of energy. This is different from most earlier food tables on GoutPal. 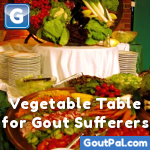 I explain why in my gout foods table introduction, where you can learn all about these tables. If you are new to my gout foods tables, it is very important that you read that introduction, and understand what these tables are about. Generally speaking, vegetables should form about one-third of your daily diet. For most people, that is enough – vegetables are good for you, so make sure fruit and vegetables are half of everything you eat. The easiest way to plan what you eat is to follow that simple rule, along with other good general nutrition advice. If you want to plan your diet in more detail, then you can use the gout foods table below to choose the best vegetables to help you meet your nutritional goals. My overall approach to gout diet is first to make sure you are eating a healthy balanced diet. Then you might want to tweak that diet to help your gout treatment plan better. That is why I produced these gout foods tables. You can use them to check if your diet is healthy. If you want to go further, you can set yourself precise nutritional goals, and use the tables to find foods that best meet those goals. The gout foods tables are all based on my imaginary standard for the “best food.” In future, you will be able to set your own standards, but the current tables still work fine for most people. If you like a simple approach to gout diet, just make sure that fruit and vegetables form about half your diet, with about twice as much vegetables compared to fruit. Variety is more important than trying to decide if one vegetable is better than another. Please note that vegetables listed below are those from the USDA Key Foods list. It might miss some of your personal favorites. This does not really matter, as you can get a reasonable approximation of the nutrient value by comparison with similar vegetables. As no single item should form a significant part of your total diet, this is near enough. If you really need that precision, please ask in the gout forums, and I will prepare a personal table that includes all your favorites, if I can find nutrition data. The table is sorted in GoutPal Index order, where my Index is based on the best of all relevant nutrients. This is fine, as all vegetables are good, so you should concentrate on variety.